What began as a fill-in pastor position at the Elgin United Methodist Church, has now become official. Rev. 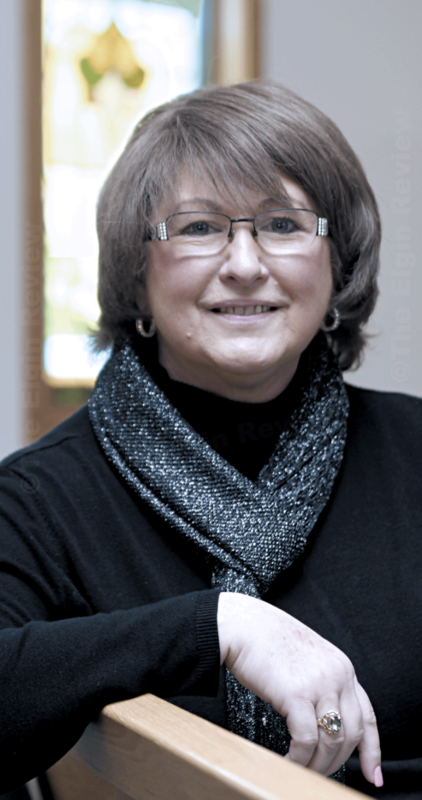 Toni Nolze will continue on as the fulltime pastor at the Elgin Church. She steps into the position previously held by Rev. William Linde who passed away last month. Prior to coming to Elgin, she served as a fill-in pastor at a church in Plainview. Prior to that she served as pastor at Methodist churches in Greeley, Scotia and North Loup. She told The Elgin Review Monday morning that coming to Elgin is like coming full circle because it was here, years ago, where she began her journey to becoming a minister. Saying it was a “caling,” Rev. Nolze credited former Elgin UMC Pastor Michael Davis for helping her to realize her mission in life. She said, at the time, she was taking a class which Pastor Davis was taking. She asked so many questions, she said, that Pastor Davis suggested she become a minister. Prior to becoming a minister, Nolze spent many years as a social worker, helping those in need, seeing difficult situations and providing assistance where possible. She said she understands suffering, having herself survived a bout with cancer. It’s given her a unique perspective, consoling famllies who have lost loved ones to the disease. Many may know the Nolze family as her husband Rick has farmed near Clearwater. Today, the family lives in O’Neill where they are raising four childen, all adopted and currently enrolled at O’Neill High School. They are Donovan, a junior who has joined the Army National Guard, Jazzmin, a sophomore, is a cheerleader at OHS. Twins Harlie and Wyatt are freshmen at the school. Together, she and Rick have eight adult children from previous marriages. Rick is also a licensed minister, serving congregations at Newman Grove and Looking Glass United Methodist Churches. She said the family has yet to decide future plans, but there’s a good chance the family will one day live in the parsonage here in Elgin. She said the parishoners here in Elgin are facing a difficult time with the loss of their minister. “They need time to heal,” she said, noting that she’s looking forward to becoming involved in fellowship activities at the church. One such activity she’s aleady particiated in is Thursday morning “Coffee Clutch.” The Thursday gatherings is a way for church members, as well as others, to share time and enjoy coffee made by Bernice Siems and goodies, from time to time, prepared by others. So, when you see Rev. Nolze around town please give her a warm “Elgin” welcome!